What is BOTOX® used for? What other treatments are similar? Who can have this procedure? Where can I have this procedure? 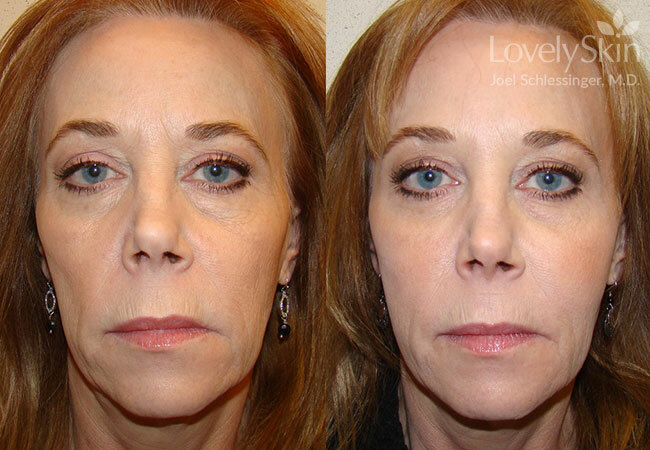 Dr. Schlessinger can improve your frown lines and crows feet with BOTOX. Who can have this procedure? Who cannot? You can relax those wrinkles with a temporary treatment of an innovative injection procedure with the prescription medication known as botulinum toxin A (the brand names are BOTOX® and Dysport™). This unlikely medication (actually a toxin) is helping many patients effectively reduce wrinkles, scars and crow's feet - without surgery or significant downtime. The unique protein composition of BOTOX® and Dysport™ actually relaxes facial muscles and gives patients a more youthful appearance. Because the positive effects of this treatment can last 3 months or more, patients at Skin Specialists are pleased with the exciting results of this safe, non-surgical procedure. 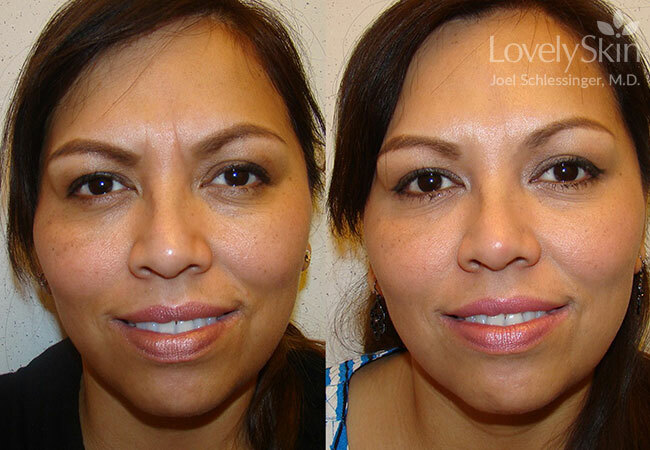 Board-certified dermatologist, Joel Schlessinger, MD, of Skin Specialists in Omaha, Nebraska and LovelySkin.com, has been offering his patients BOTOX® for more than 20 years. He is a national expert and lectures widely on the subject of wrinkle relaxers. He is one of a select few members in the National BOTOX® Training Center Network, and Skin Specialists is the only national training site in Nebraska. Before and after botox injections. In addition, Dr. Schlessinger participated in the clinical trials of Dysport™. In his private practice in Omaha, Nebraska, he had the highest number of patients on Dysport™ prior to its approval than any other clinic in the U.S. He has injected more than 1,500 patients with Dysport™ over the past 5 years. Having more experience with BOTOX® and Dysport™ than most cosmetic surgeons in the nation, Dr. Schlessinger is the natural choice to go to for this procedure. Help get rid of crow's feet, scars and wrinkles with Botox. What is BOTOX® for wrinkes? From frown lines to crow's feet, BOTOX® can lift your spirits and improve your wrinkles at the same time. With a few tiny injections BOTOX® will take effect over a period of days to banish frown lines and many other telltale signs of aging. BOTOX® is the original formulation of botulinum toxin A. Recently, similar products such as Dysport™ have been approved by the FDA for use in relaxing wrinkles. There are subtle differences between BOTOX® and Dysport™. Some patients are more suited for one or the other. Dr. Schlessinger makes the decision which to choose when he consults with patients at his Midwest office before treatment. "BOTOX® is an incredibly useful tool," says Dr. Schlessinger. "In the right hands, it can accentuate the eyes and make them look much more attractive." BOTOX® is used to smooth frown lines and wrinkles between the eyebrows, known as glabellar lines, and on the forehead. BOTOX® can also smooth crow's feet around the eyes. 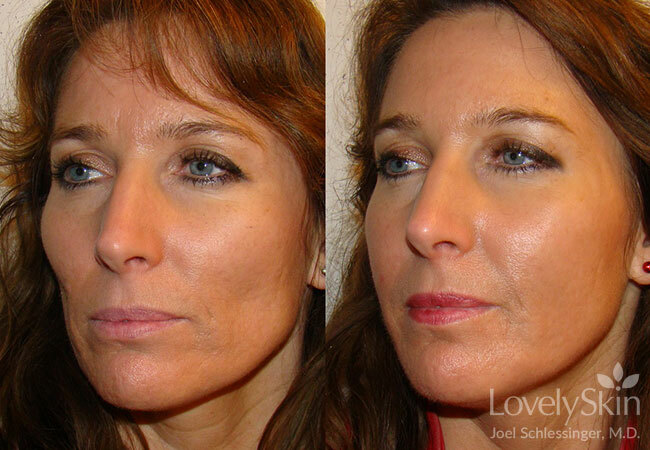 Dr. Schlessinger has also used BOTOX® to relax smoker's lines on the lips and around the mouth. Occasionally he uses BOTOX® on the chin area for patients who tend to dimple their chins. Dr. Schlessinger advises that patients go to skilled physicians who do hundreds and thousands of BOTOX® procedures because these experts will know how to do the other areas without side effects. See the remarkable results for yourself. You can visualize the results on a photo of yourself at the BOTOX® Web site. Click here to access the visualization tool where you may upload a current photo of yourself. How does BOTOX® for wrinkles work? Talk with Dr. Schlessinger prior to your procedure about your goals for using BOTOX® or Dysport™ and feel free to ask any other questions regarding cosmetic procedures. Dr. Schlessinger and his patient coordinator are very willing to answer questions and want to hear from you if you have any. If you want to reduce the appearance of wrinkles around your eyes and on your forehead, BOTOX® may be an outstanding choice. Your results will depend on your overall goal and suitability. Dr. Schlessinger is very good about letting patients know if they are good candidates for treatments and choosing which treatment may work best. After the treatment, you will see a relaxing of the frown lines and wrinkles between your eyebrows (the "11" mark as some people refer to it) and on your forehead in anywhere from 3 to 4 days. Sometimes it can take up to a week for the full treatment to take effect. Dr. Schlessinger recommends that patients stop taking any aspirin or aspirin-like products about a week or so before the procedure. This would include Motrin (Tylenol would be okay to continue). This decreases the likelihood of bruising. Some patients experience a little bruising at the injection site, which can be covered with a little makeup. You may have fillers injected at the same office visit along with BOTOX® or Dysport™. If you are taking antibiotics, there should be no problem continuing them if you have this procedure. But talk with the doctor about all medications you are taking. To read more about side effects, click here. Before and after Botox, Voluma, Juvederm, Perlane, Restylane. Before and after Botox, Voluma, Juvederm, Restylane and Perlane. 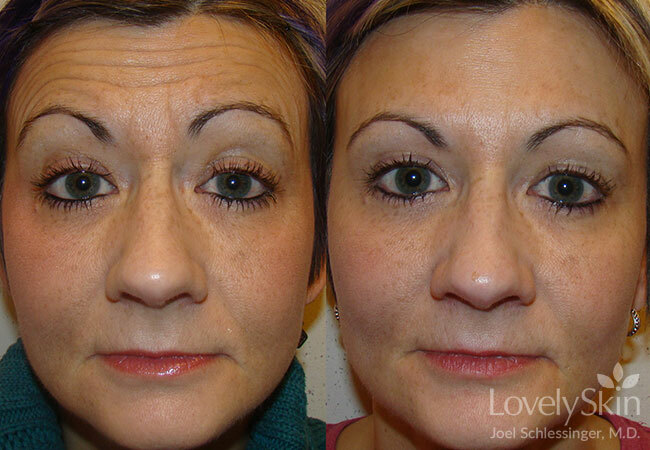 Before and after Botox, Filler (Restylane & Perlane). Contact Skin Specialists in Omaha, Nebraska for an evaluation for treatment of your skin condition. The patient coordinator will show you around the office to acquaint you with the facility and where you will have your treatment. You will have a consultation in the comfortable and high-tech office of the patient coordinator, meeting with Dr. Schlessinger to answer any questions you might have. The doctor's office staff will take photographs to show you where your wrinkles may be improved and relate options to you. These will be used to compare with the results 2 weeks later at your no-charge follow-up appointment. Your facial area and planned site for the injections will be cleaned and a topical numbing solution will be applied. Dr. Schlessinger will perform the injections. In Dr. Schlessinger's office, the only individual who works on you is the doctor - no nurses or other staff members administer BOTOX®, Dysport™, or fillers as is the practice in many other offices. Dr. Schlessinger is very proud of the results he obtains, and this is one of the reasons he has been voted Best Cosmetic Surgeon in Omaha, Nebraska for 16 years in a row. The actual injections are quick and nearly painless with the use of numbing topically and Dr. Schlessinger's excellent technique. A very small amount of BOTOX® is injected with an ultra-thin needle very precisely into several areas. Most patients compare the sensation to a little sting. You can resume normal activities immediately. What other cosmetic treatments are similar? BOTOX®, a registered brand name for botulinum toxin A produced by the company Allergan, has been alone in the market for this type of product until the introduction of Dysport™ in 2009. Medicis is the company that makes Dysport™. Only Dysport™ and BOTOX® have been approved by the FDA as wrinkle relaxers. The main new forms of botulinum toxin currently in Phase III clinical trials are PurTox (Mentor Corporation) and NT201 (Merz Pharmaceuticals). Also, there are other forms of toxins from China, Brazil, and South Korea that are being tested in countries other than the United States. Other products can reduce wrinkles in additional areas of your face. See the discussion on this Web site on Restylane®, JUVEDERM®, and Dysport™. Are there side effects of BOTOX® injections? Talk with Dr. Schlessinger during your consultation or your doctor about whether this procedure is right for you. If you have been treated for muscle spasms or have underlying medical conditions that would make some of the side effects more likely, notify your doctor. This treatment may not be right for you. Where can I have this procedure performed? If you live in the Omaha, Nebraska area, Dr. Schlessinger would welcome your call at 402-334-7546 for an appointment to discuss treatment with wrinkle relaxers. If you live elsewhere, consult with a dermatologist who specializes in cosmetic dermatology and does his or her own treatments rather than handing them off to a nurse or non-MD. It takes skill and technique to get the really good results from BOTOX®, Dysport™, and any other wrinkle relaxers and fillers. Typically that means that you have to have an MD, and usually a good dermatologist or cosmetic surgeon, do the procedure. Dr. Schlessinger sees the poor results when patients go to fly-by-night clinics for their BOTOX®. Solutions are diluted significantly. They aren't as potent, and the technique is poorly done. The results in these cases often make patients look worse rather than better. As a board certified dermatologist, Dr. Schlessinger performs all of the BOTOX® treatments on his patients. If you go to a clinic that is run by a reputable dermatologist and/or cosmetic surgeon, these professionals should be the ones doing the treatments. Congratulations on considering this exciting procedure! You are in good hands when you come to Dr. Schlessinger's Midwest office and you will feel welcomed and comfortable. We look forward to meeting you!